Can't Find Minimalist Shoes that Fit? Make Your Own! I got into the minimal shoe thing after hiking the Pacific Crest Trail. My first attempt left me crippled when, after 900 miles of successful hiking, I replaced some comfortable shoes with a pair of highly-recommended motion control shoes. I was in excruciating pain within 100 miles and completely injured within 300 miles. I searched online for answers to what caused this and found the answers in articles at the Unshod website. I returned to the trail the following year with slightly simpler trail runners and hiked all the way to Canada. After completing the trail I was still interested in what the barefoot folks had to say about shoes and injuries, but being a hiker, I found it very difficult to be barefoot and hike my favorite trails. I was determined to find shoes that I could wear hiking and backpacking that wouldn't hurt or deform my feet. The shoes had to be zero-drop, super wide toebox, minimal EVA cushioning but enough to protect me from rocks, and if possible, be shoes rather than sandals to protect my feet from chafing and foxtails. They also had to have good traction. Unfortunately, I wasn't able to find any shoes that met all these criteria so I decided I would make my own shoes. First I found a website with patterns from medieval shoes (http://www.personal.utulsa.edu/~marc-carlson/shoe/SHOEHOM3.HTM). The patterns were just images and approximations, but I chose a pattern that looked pretty simple and kind of free-handed it. I made a pair of shoes using that pattern, some scrap fabric and a pair of flip-flops with the straps cut off for the sole. I was amazed when I put them on and went for a walk. I actually made a pair of shoes! I decided I would keep trying until I made a perfect pair of hiking shoes. I made several pairs of shoes, but each time I took them out on the trail I thought maybe I could do better. So I kept making shoes. 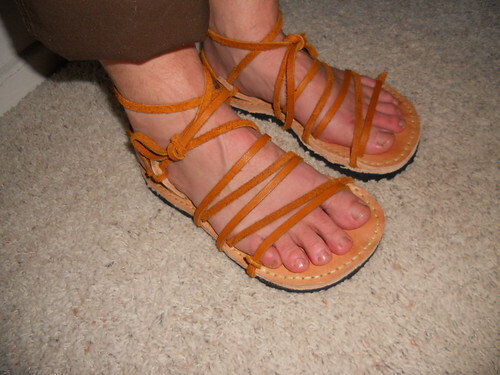 I found a website called Simple Shoemaking where there was a pattern for fisherman sandals with instructions. I downloaded the pattern and followed the instructions to the best of my ability. This showed me how to stitch an upper to a sole and then I could glue a Vibram sole to the bottom and protect my stitches. After I made the sandals, I realized that it would be the same process for shoes if only I could figure out how to make an upper that wasn't a sandal. Fortunately, there were patterns for sale on the Simple Shoemaking site. I bought a few patterns and gave them a try. Since my feet are a size 7EEEE and the patterns are all an ordinary women's size 9, I had to xerox the pattern to shrink it and then modify the pattern to add width. Not all the patterns would work for this. I also had trouble with some patterns where the heel piece was a convex shape along the back seam. For my own heel, it worked better if the heel was a straight line that angled sharply toward my achilles. It took some trial and error to get the pattern so that it would work for me. The shoe didn't hug my insole well enough so I cut the shoe to fit better there. I basically just put them on and traced where I should cut and then took them apart, cut them and put them back together. Initially I used a middle sole of 1/4" EVA foam and glued 8mm Vibram Newflex (Cobbler Supplies) to that. The EVA foam was too hard and inflexible and made the shoes uncomfortable. I wasn't sure how the two pieces went together so I sewed them together. They are really hard to slip on. I guess I shouldn't have sewn them together along the sides. The sole is a little bit thin for long distance walking, but I have hiked in them and been very happy with how they feel. I have hiked on snow in them, hiked cross-country and backpacked. Even after I made these shoes I took them apart a couple of times and one time I even cut some of the shoe so that it would fit better. I plan to take them apart one more time and try inserting a little more cushioning so I can hike longer distances. I've done a lot of trial and with soles. It seems to work best for me if the sole has a lot of flexibility and not too much stiffness, but it has been hard to find a balance between the two. Some soling materials are too squishy (flip-flops), others too stiff (55 durometer EVA). Some don't stick to the glue very well. In the end, what seems most "professional" is to stitch the upper to two sole-shaped pieces of leather (upholstery or chap leather) with a 1/8" layer of EVA foam sandwiched in between and then glue that to 5mm or 8mm Vibram Newflex. That gives me a flexible sole with a little cushioning and a midsole that won't come unglued from the Newflex. With the suede sides out on both pieces of the mid-sole leather, the glue adheres well to the Newflex layer and my foot doesn't slip around too much inside the shoe. For sandals, what works well is to just use vegetable tanned leather, possibly with a layer of suede glued to the top to control slipping, and skip the cushioning. Glue the Newflex to the vegetabe tanned leather. In the process of trying to make the perfect hiking shoes, I've made a lot of shoes and sandals I can wear to work or casually. All I really wanted to do was make a pair of Barefoot Ted Huarache sandals but for some reason I just couldn't get it right. For some reason, I thought shoes were easier. I didn't have to figure out where to place the straps. There was no chafing from straps or feet slipping off the back. I alwasy hoped to return a simple huarache, and after about 30 pairs of shoes, I finally made a pair of huarache sandals that stay on my foot and don't hurt. I think I improved on them a little because mine have two layers of sole, the bottom layer proecting the straps so they won't break from rubbing on the ground. Even though I've made hiking shoes, I still do a lot of backpacking with Chaco sandals. I like that they dry quickly and being thick-soled, I'm more confident that I can do big miles in them. Recently I was inspired by the Shoes or No Shoes Museum website to try making some sandals like the Mexican Yaqui sandals pictured on their site (do a search for #1719 in the Ethnic Collection). It takes a lot of effort to make shoes so I wanted the straps to not come in contact with the ground and possibly break. So I added another layer of vegetable tanned leather to protect the laces and stitched them together and then glued on 8mm Vibram Newflex. They're not very minimal, except for being zero-dropped and no arch support, but still flexible and comfortable. I'm pretty happy with them. With any luck, perhaps they can replace my Chacos. Next I may try to make them from all synthetic materials and nylon webbing so they'll have the same quick-drying of Chacos. It's possible you will have a lot of questions for me after all this. I will just refer you to the Simple Shoemaking fisherman sandal instructions because that's all I really know. That page explains the tools and the methods that I use. The rest is all trial and error that you'll have to figure out because everybody's feet and preferences are different and everybody has different creative capabilities. I encourage you to give this a try. You can make moccasins or sandals or simple shoes like I have. They can be super minimal or not quite so minimal like I tend toward. I think there's a range for minimal shoes, and sometimes I like a barefoot feel and sometimes I like a more shoe-like feel. One thing is certain: I have had no stress fractures or other injuries since I set aside my overbuilt, too-narrow, too-everything commercial shoes and turned to homemade shoes. My feet and ankles have become very strong. I can hike and backpack wearing shoes or sandals that I made myself. Diane lives in Santa Barbara and runs Santa Barbara Hikes. She is a hiker and backpacker and has hiked the Pacific Crest Trail as well as the trails in Santa Barbara and Ventura counties.